A funny thing about the A’s: despite all the losing in the second half of the season, they still finished the year sporting baseball’s best Pythagorean Record, at 99-63. Unfortunately, a lot of that insane run differential was racked up when they were scorching the league in the first half of the season. The fact that their actual record is eleven wins worse isn’t just because of a run of bad luck; they legitimately played like crap in the season’s second half. There are theories abound for why the A’s suddenly started stinking it up, but I think it comes down to one simple answer: a bunch of guys played way over their heads in the first three months, and they all regressed at the same time in the last two months, and as a result, the team stopped hitting. The A’s hit an anemic .233/.306/.352 in the season’s second half, and hit just 48 home runs after hitting a whopping 98 (!) in the first half. The pitching more or less stayed the same, which isn’t surprising considering Billy Beane bet the ranch by acquiring Jeff Samardzija and Jon Lester in July. Nope, plain and simple, it was the hitters suddenly not doing hitter-type things that brought the A’s to within one game of an embarrassing collapse. The power dried up, and then so did the wins, but the drop in offense was probably foreseeable, considering some of the guys who were tearing it up in April and May. Let’s take a quick look at the main culprits in this second half offensive drought. Norris hit .226 in his first two major league seasons. Kickass beard and all, there was just no way in hell he was going to keep hitting .386, as he did in April. He didn’t exactly tank, but he did start to hit (predictably) like his normal self in the second half, which smarted even more when the A’s other catcher, John Jaso, went down with a concussion for the second straight year. I love Stephen Vogt, and he’s done nothing but hit in a lengthy pro career, but .358? No way. Vogt’s ice-cold second half brought his numbers more in line with his 2013 output. He had fans thinking he’d turned into a star hitter for a while, but in the end he’s simply a solid bench/platoon bat and not much more. The disappearance of Moss’s bat was perhaps the most inexplicable of any of the slumping A’s hitters. After clubbing 21 homers in the first half, Moss hit four…count ’em, four…after the break. He hit his 23rd home run of the season on July 24th, then didn’t hit another one until September 14th! Needless to say, the sudden ineffectiveness of one of their most reliable power bats absolutely killed the A’s. Moss has bashed 76 home runs in three seasons with the A’s but as a Three True Outcomes type he’s slump-prone, and his sordid second half may unfortunately be an indicator that he’s following the path of so many Jack Custs before him. The A’s top-of-the-lineup catalyst couldn’t get on base to save his life after the break. His poor hitting was probably at least partially attributable to a nagging neck injury that bothered him in August and September, but certainly also to the fact that he just isn’t a .290 hitter. He hasn’t hit that high in a season since 2005. In addition, John Jaso got hurt, Jed Lowrie slumped, and Alberto Callaspo couldn’t hit his way out of a paper bag all year. None of those factors helped matters much, but the lion’s share of the blame for the offensive tank job was placed on the trade of Yoenis Cespedes to Boston and the resulting psychologically negative domino effect his absence had on the rest of the lineup. I definitely agree that his presence was missed, but he had a .303 OBP when he was traded. His offensive impact was probably a little overstated, in general. The A’s stopped winning when they stopped hitting home runs. I mean, they hit a lot of home runs in the first half, at a rate that was unsustainable, given the history of the players hitting them. Maybe if Cespedes stays they keep up the pace, but I have my doubts. Cespedes himself only mustered five home runs in 51 games with the Red Sox, despite playing in a much friendlier park for home runs. Josh Donaldson and Moss were both on pace to hit close to 40 home runs when the All-Star Break hit. This isn’t the late-90’s sillyball era anymore. Only one player made it to 40 homers this season (Nelson Cruz), and only seven players reached 35. To think that Donaldson and Moss could keep up that pace, in a tough home run park, no less, was probably unrealistic. Also, Norris, Vogt, and probably Crisp were hitting over their heads in the first part of the season. Frankly, it would have been completely shocking if they hadn’t dropped off a bit (Donaldson hit extremely well in the second half, but just not with the same kind of power). So the A’s roll into a one-game playoff having narrowly avoided a near-historic collapse, and boast an offense that has been in a trance since before Guardians of the Galaxy came out. That’s the bad news. The good news? There are only a handful of pitchers in baseball who you’d rather have going in a do-or-die elimination game than Jon Lester. 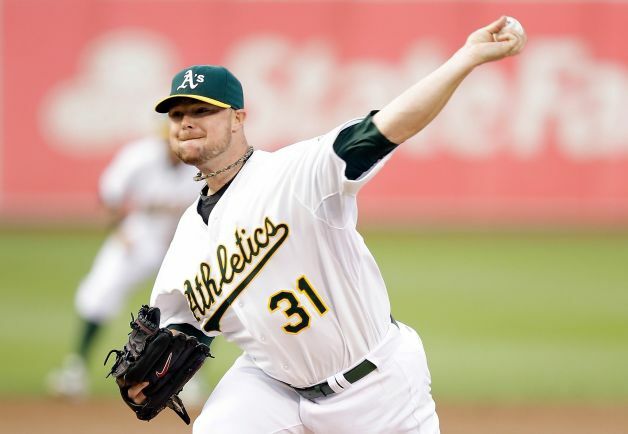 Lester was brought to Oakland at the trade deadline for this very reason: to start huge games and win them. Lester has been lights out all season and he has more big game experience than just about any pitcher in the big leagues now, having won all three of his career World Series starts (including the Series-clincher for the Red Sox in 2007). A’s fans should feel very confident in resting their team’s season hopes on this guy. The A’s also get the benefit of facing a Royals team that sports a lineup that just isn’t very good. The Royals are in the playoffs for the first time in 30 years, which is great, but they did so in spite of a pretty crummy hitting attack. They have easily the most impotent offense of any playoff team, having finished ninth in the AL in runs scored and dead last in home runs. Unlike, say, the Tigers, Angels, or Orioles, the Royals lack a true star-caliber impact bat. Billy Butler used to be their best hitter, but he forgot how to hit this year for some reason and so now they basically have Alex Gordon and a cast of bats you could charitably deem average. No Kansas City player reached 20 home runs (Gordon led the team with 19), and just two of their regulars finished with an OPS+ over 100. They led the AL in stolen bases, but what does that matter if your hitters can’t get on base? To wit: they finished dead last in walks drawn and near the bottom in OBP. Their offense is definitely their Achilles heel. The Royals will counter Lester with their ace, James Shields, aka “Big Game James”, who was called that before he had pitched a single actual big game with Tampa Bay, so the nickname is a bit ridiculous. However, he’s a tough cookie who won’t play into the patient Oakland lineup’s hands by walking batters, and he’s the type to make short work of a lineup if he gets into a groove. The Royals also sport one of the most imposing bullpens in history, behind the insanely good troika of Greg Holland, Wade Davis, and Kelvin Herrera. Davis and Herrera threw a combined 142 innings this year without surrendering a single home run. Thats…incredible. Davis in particular was otherworldly, striking out 109 batters in 72 innings and posting an absurd 1.19 FIP. Holland might be the best closer in baseball, but he’s still a relative obscurity. He wasn’t as good as Davis, “only” posting a 1.44 ERA. So, basically, if the A’s get behind early, they’re probably totally screwed. I think in the end I’d put my money on Lester chewing through this weak Royal offense to put the A’s on top. Shields stays in the strike zone all game and can consequently get homer-prone. I think the A’s will club a couple of early home runs, Lester will dominate thoroughly for eight innings, and the boys in green and gold will prevail tomorrow, 3-0, to advance to the NLDS to take on the Angels. This entry was posted in Baseball, oakland a's and tagged baseball, jon lester, kansas city royals, oakland a's. Bookmark the permalink.